"Orange juice, bourbon and lemon-lime soda are stirred together in this quick, easy, and quite tasty punch. I have never had a complaint about this one." 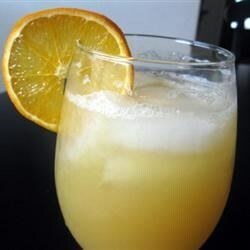 In a punch bowl or other large container, combine the orange juice concentrate, whiskey and lemon-lime soda. Stir until mixed, then throw in some ice before serving. Wow, super delicious! I do not like bourbon but was given a HUGE bottle so I was trying to find a way to disguise it. Perfect! Thanks! This is surprisingly good. I also made it with some maraschino cherry juice and the cherries added for garnish. I wanted to make an easy cocktail for a get together, and this was perfect! I made half the recipe and served in a pitcher. Everyone enjoyed it - we didn’t even open the bottle of wine!